The Transit, from the German/American company, Ford, has been a loyal work companion for many companies, tradesmen and craftsmen since 1953. We are talking about a full-size van, which underwent a last drastic restyling in 2006 and therefore it is not as up-to-date as some of the other models in its class that have been introduced on the market in the years following. Even though it may not be one of the more modern and innovative vans, it still has a lot of positive factors that should not be overlooked, including the Ford tradition of providing ample cargo space which lends itself to a vast possibility of upfitting options. Ultimately, the Transit is a great value for its moderate price. 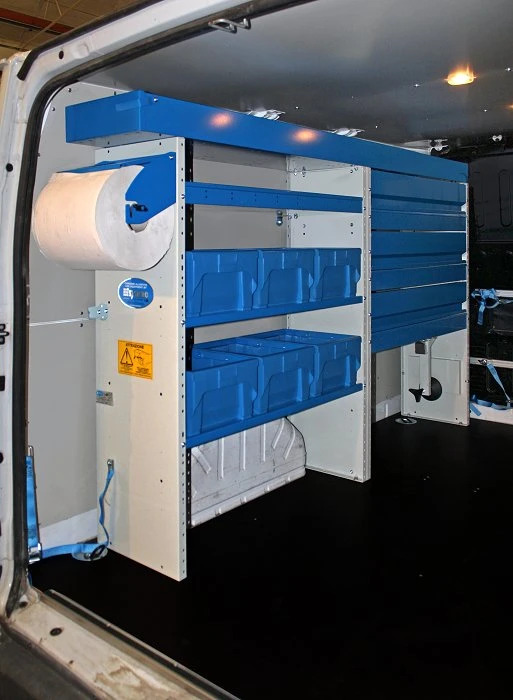 Since 1996, the Group Syncro has been designing, building and installing a full range of van side lining, floor panels, shelving and roof-top utility racks for the Transit; over the years, Syncro has upfitted thousands of Transits all over the world. On this page, we will take a close look at a simple yet highy functional interior upfit of a Ford Transit. 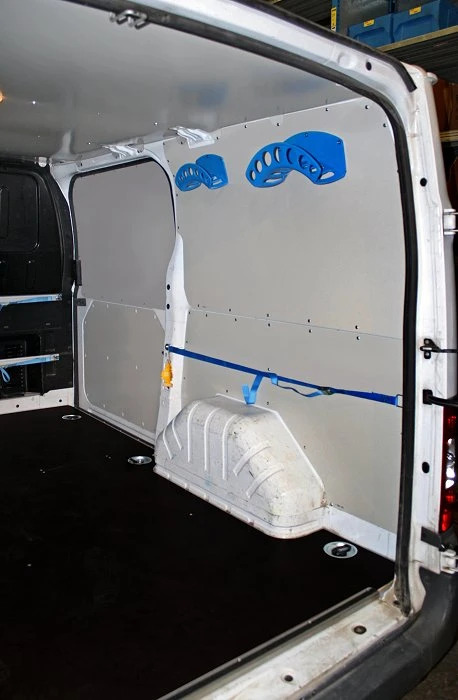 The first step in the upfit of this commercial van was to protect the cargo area walls, floor, and ceiling. 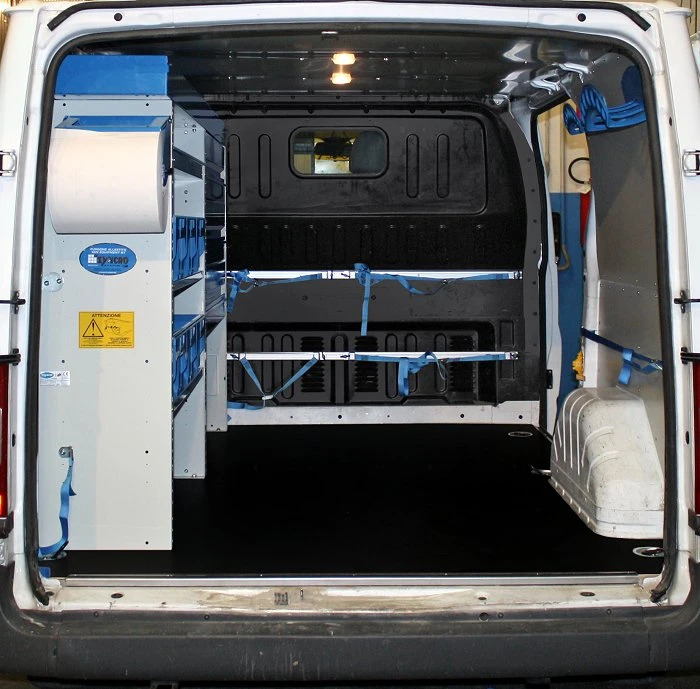 For the floor, we put down a 12mm, coated, extremely durable, plywood floor panel with steel borders along the edges coinciding with the van doors, complete with recessed steel anchorage points designed to lock down cargo using cables or straps. The wall protection consists of coated galvanize steel sheets, cut to size. It is a solution that protects the underlying metal of the bodywork that could sustain serious damage with the wear and tear that comes with the territory in working vehicles. In this particular upfit, we also lined the ceiling of the van. On the lower left side of the cargo area, we installed two wheelhouse covers, one complete with the Syncro portable case storage and locking system. Above that, we mounted a metal shelving unit with two long shelves that house six large plastic containers with metal handles (model CAS35) - extremely popular due to their ability to organize and neatly store a multitude of parts and fittings that can be either left in the van or brought to the work site. Above CAS35 containers, is another shelf with metal dividers and non-slip mats. 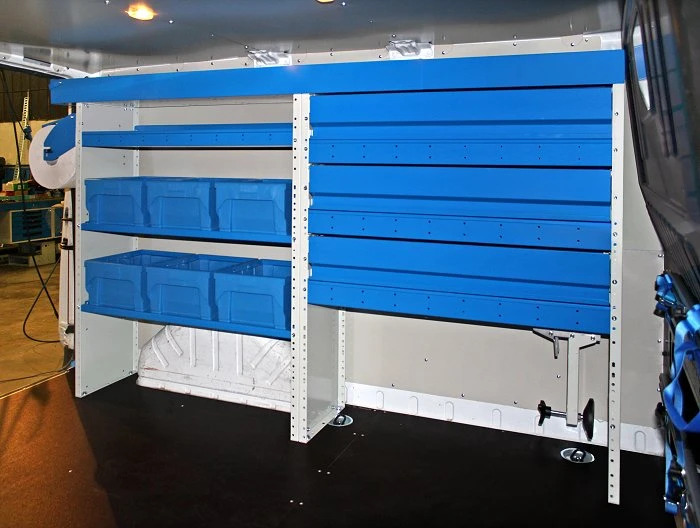 This particular module unit includes three shelves with hinged locking doors, complete with dividers and non-slip mats. At the top of the shelving unit, we placed a long tray with raised sides and locking end flap – perfect for transporting tubes, pipes, poles, etc. The right side of the cargo area was left free. A few useful accessories were added to improve the functionality of the vehicle: on the right side, we mounted two hanging cable hanger in cast aluminum, perfect for extensions cords, probes and cables, and a strap and clasp to secure light cargo in place. Two aluminum tracks with straps and clasps were mounted to the bulkhead in the back of the cargo space for securing heavier cargo. Another strap and clasp were added to the left-and side between the corner of the shelving unit and the side back corner of the van. Washing your hands at the work site can often be difficult. In this upfit we mounted, the Syncro hand-washing kit, complete with 10-litre water jug with spout and soap dispenser, was mounted to the left back door, along with the paper towel roll holder (for 280 mm paper towel rolls). 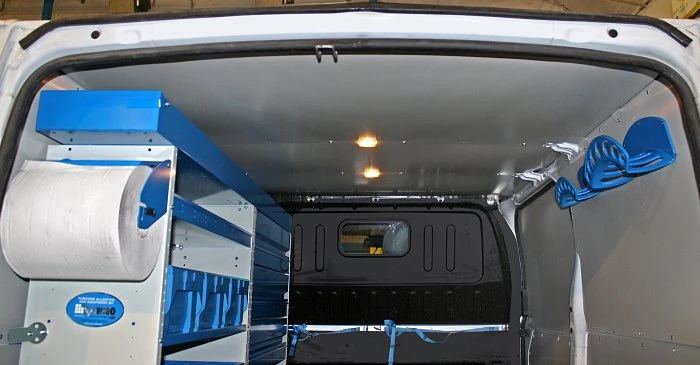 Thanks to the remarkable modularity of the Syncro system, this Ford Transit, like all our upfits, has been customized down to the smallest detail to perfectly meet the business needs of the customer. Click here to see more examples of upfits, floor panels and side lining and utility racks for the Ford Transit.